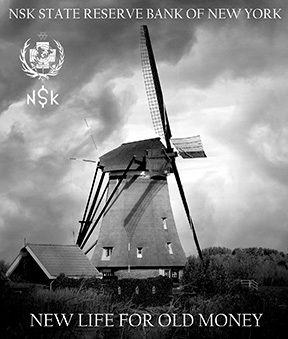 The NSK State Reserve is responsible for the supply and distribution of currency for the NSK State, a virtual state founded by the Neue Slowenische Kunst collective in 1991. While the individual currency notes (colloquially referred to as N$K) are intriguing artifacts individually, the broader purpose of the notes and the NSK State Reserve is to create a circulating medium which connects NSK State citizens. 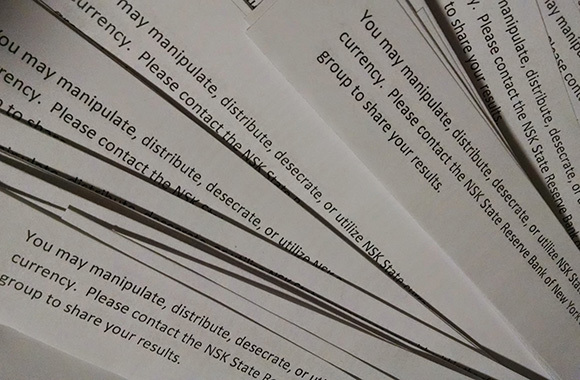 Through the distribution of thousands of these notes the NSK State Reserve aims to enliven the state by stimulating connectivity between its citizens, and materializing the network that connects them. In the tradition of occupying powers, these notes are created through a process of overprinting and hand stamping on existing financial devices, creating a parasitic relationship with the original issuer. Often the substrate is a "dead" currency, either one that has been retired from circulation or one that was originally issued by a state which no longer exists. The first notes issued by the NSK State reserve were printed on the Yugoslavian dinar, a currency of particular meaning for the NSK State, which was founded during the fragmentation of the Yugoslav republic. The resurrection of this currency is sometimes also experienced as a resurrection of the times to which it belonged, and the state that once produced them. This recapitulation is in keeping with the spirit of the NSK State, as is the second life granted to these once discarded artifacts. New Life for Old Money. 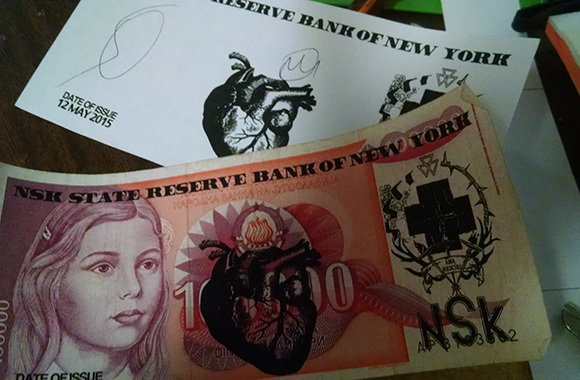 A later edition, released on August 19, 2015, recycled retired North Korean currency, re-issued to commemorate the visit of the band Laibach, one of the original members of the Neue Slowenische Kunst collective, to that country. 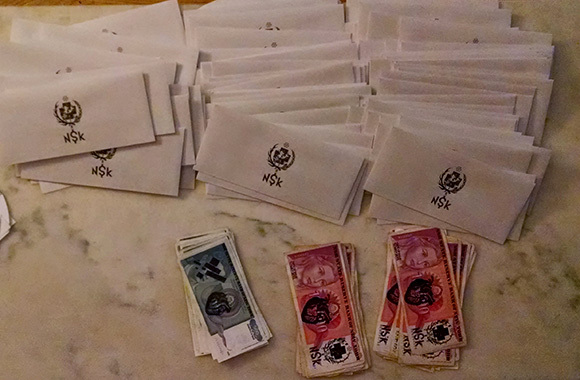 The North Korean won had also experienced hyperinflation and was retired in a pecuniary action which required all North Korean citizens to exchange these bills for a new edition, in the process weeding out and nullifying large stashes of black market wealth. 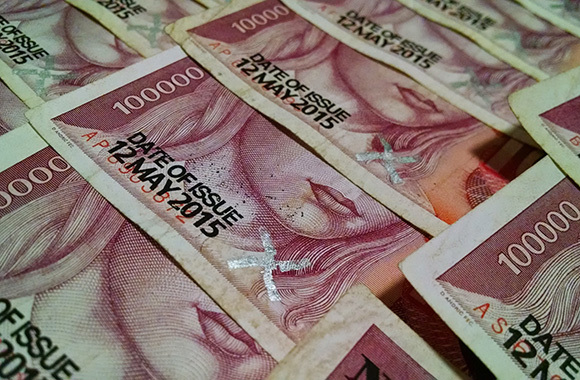 The existing currency was made not only worthless, but illegal. The Reserve's interest in re-using old currency now cheaply available has the emergent property of pointing to traumatic events of the past. 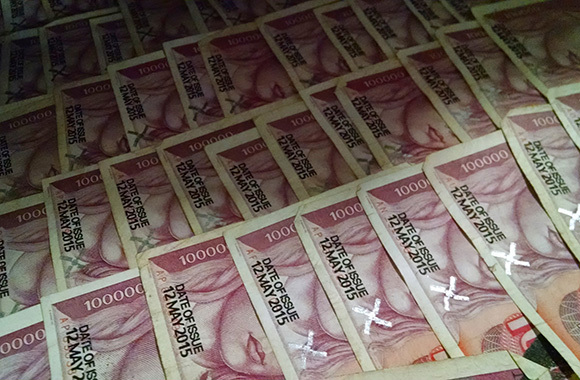 Occasionally the Reserve uses active currency as a substrate, as in this example which utilizes the Russian ruble. While still a valid currency, the value of the ruble has dropped to the point that each of the 10 ruble notes overstamped to become NSK State currency was worth on the order of ten to fifteen American cents. These notes were created to commemorate the naturalization of a group of NSK State citizens at the offices of NADA in New York, and draws from an NSK production performed in 1986 titled Krst pod Triglav ("Baptism under Triglav"), their interpretation of a classic Slovenian work describing the forced conversion of the last pagan Slavs to Christianity. While the new citizens were not forced in any way, this day did mark their entry into a society of over 14,000 NSK State passport holders. 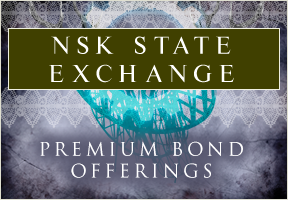 In 2017, the NSK State Reserve will continue to pursue their mission to provide liquidity to the NSK State by issuing bonds to fund increased distribution. While these are are not exchange-traded financial instruments they will operate in a similar fashion - in return for the purchase of the bond the holder will receive 'coupons' of NSK State currency. One of the operations funded by this bond issue will be a program to make disbursements of the currency available for free to all NSK State citizens.